Four local high schools will be a part of Jump Institute on July 21 at Hook Field in <?xml:namespace prefix = st1 ns = "urn:schemas-microsoft-com:office:smarttags" />Middletown. 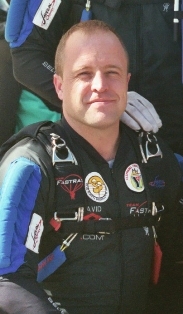 Skydiver, author, national speaker, trainer and former U.S. Army Ranger David Hart (Photo) will lead the team-building, personal development training for incoming seniors from Edgewood, Middletown and Fenwick High Schools and Butler Tech Career Center. He is offering the training free to 20 young people from each school as a part of the Ohio Challenge Hot Air Balloon Festival pre-event schedule. Earlier in the week, Mr. Hart will be presenting his training sessions at the Hook Field Airport in Middletown for his corporate clients and has offered the free session for high school students as a community service. Also, throughout the week, the Fastrax Skydiving Team will be practicing at the airport. High School students will end their half-day session with a fun competition and by learning the world-record-setting skydive formation�on the ground. The 20 members of Team Fastrax will perform throughout the Ohio Challenge Hot Air Balloon Festival demonstrating competition skydiving, including water landings in Smith Pond. Mr. Hart�s skydiving team is the most ambitious commercial skydiving team project in the world. The team has a combined total of 200,000 skydives and competes in multiple skydiving disciplines, nationally and internationally. Earlier in the summer, they will be skydiving into Dayton Dragons games. Ohio Challenge Hot Air Balloon Festival is scheduled for July 21-22-23, 2006 at Smith Park in downtown Middletown. Primary sponsor MidFirst Credit Union and other sponsors bring a full weekend of entertainment including sanctioned hot air balloon competition, special shape balloons, specialty sport events, musical concerts, festival foods, arts and crafts vendors, a carnival, and much more.